Above Photo: Spc. Zayid Ballesteros/U.S. Africa Command. 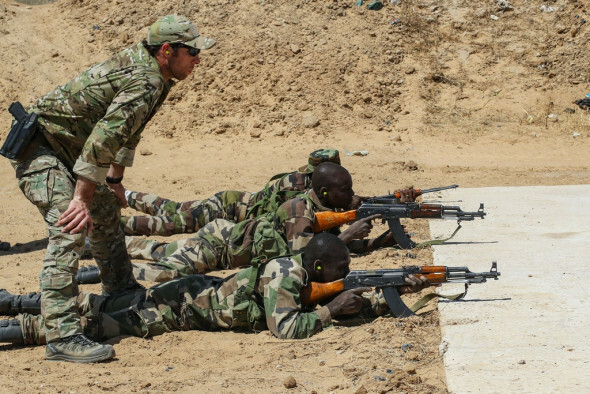 A U.S. Army Special Forces weapons sergeant speaks to a group of Nigerien soldiers during Exercise Flintlock 2017 in Diffa, Niger, on March 11, 2017. Soon, however, Islamist militants pushed out the Tuaregs, took over much of the north, instituted a harsh brand of Sharia law, and created a humanitarian crisis that displaced hundreds of thousands. But Sanogo’s junta proved no more militarily effective than the government he overthrew. “The coup made everything a lot worse. The coup didn’t yield a strongman. The coup yielded nothing, just vacancy,” said Shurkin. 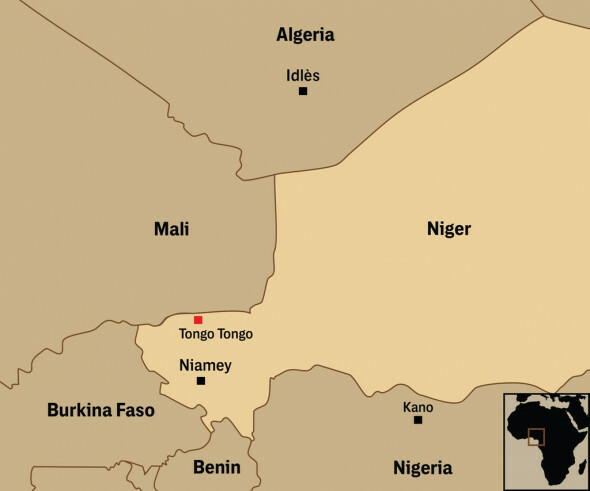 In 2013, with Islamist militants besting Sanogo’s military, a U.S.-backed French and multinational regional force intervened to prevent a takeover of the country. Since then, Mali has been mired in an intractable insurgency and militant groups have thrived in the vacuum. Airmen from the 724th Expeditionary Air Base Squadron and soldiers from the 411th Military Police Company, 89th MP Brigade, 1st Platoon, tear up wooden pallets as they move to a new location, Sept. 11, 2017, at Air Base 201 in Agadez, Niger. FOR ITS PART, AFRICOM says its forces are “supporting the U.S. Embassy” in the country’s capital, Niamey. Troops are also stationed at Base Aerienne 201 (Airbase 201), outside the city of Agadez, a transit hub at the edge of the Sahara in Central Niger, “supporting ISR,” or intelligence, surveillance, and reconnaissance operations, according to Baldanza. AFRICOM calls Base Aerienne 201 “a temporary, expeditionary contingency support location,” but The Intercept previously revealed it is, in fact, a $100 million drone base in the making. According to declassified secret documents from 2015, obtained via the Freedom of Information Act, Niger was the “only country in NW [northwest] Africa willing to allow basing of MQ-9s,” the larger, potentially more lethal cousins of the Predator drone. The documents went on to note that Niger’s president “expressed willingness to support armed RPAs,” or remotely piloted aircraft, the military euphemism for drones. New reports indicate the United States is now pressing Niger to allow the deployment of such drones in order to carry out lethal strikes there. “RPA presence in NW Africa supports operations against seven [Department of State]-designated foreign terrorist organizations. 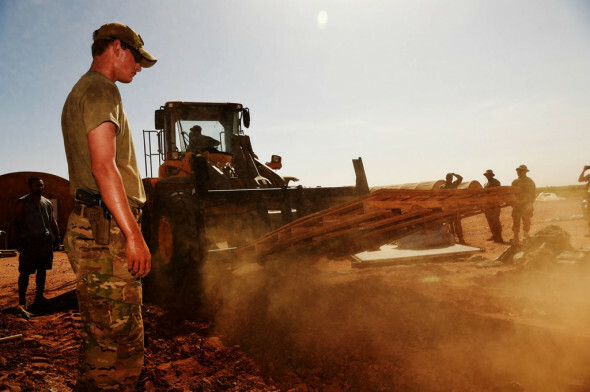 Moving operations to Agadez aligns persistent ISR to current and emerging threats over Niger and Chad … and extends range to cover Libya and Nigeria,” say the 2015 files, which also call Agadez the “top MILCON [military construction] project for USAFRICOM.” That construction continues to this day. The Pentagon refused to comment on the size of troop levels at Niger’s bases, citing security concerns. Some indication can, however, be gleaned from an Air Force contract awarded last month for 80 Quonset hut-shaped prefab tent structures at Air Base 201 — the type of structures long ubiquitous at bases in Iraq and Afghanistan, providing about 800 separate rooms. AFRICOM cryptically adds that U.S. personnel are also “stationed in the country for other temporary duties and operations.” Recent contracting documents from the Defense Logistics Agency reference a Joint Special Operations Air Component and indicate ongoing needs for diesel and jet fuel at Niger’s Base Aérienne 101, a longtime U.S. drone outpost, attached to Diori Hamani International Airport in the country’s capital, Niamey; it is used for regional ISR missions. The U.S. is also considering beefing up Air Base 101 by adding defensive fighting positions — towers to provide blast and ballistic protection with gun ports that allow troops to return fire — according to Air Force contracting documents issued this past summer. Contracting documents also indicate future requirements for fuel at a number of other Nigerien locales, including Tahoua and Ouallam, as well as the need for 4,400 gallons per month of gasoline, 1,100 gallons per month of diesel fuel, and 6,000 gallons of aviation turbine fuel every 90 days to be delivered to a “military installation” in Dirkou. A DLA document from this summer also shows potential interest in deliveries of unleaded gasoline and diesel fuel to the village of Tillia.